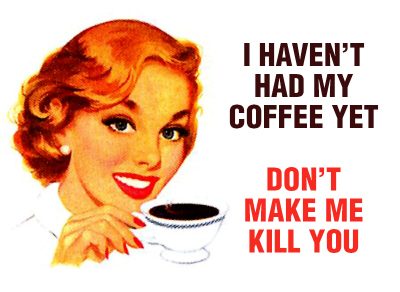 I don't know if my coffee consumption is going to kill me, but from recent news reports, it certainly appears that caffeine has homicidal tendencies. Caffeinated alcoholic beverages will PUT YOU IN THE HOSPITAL! Two spoonfuls of pure caffeine will MAKE YOU BARF AND DIE! Caffeine'll make you KILL YOUR WIFE! On the plus side, thanks to the Death by Caffeine Calculator, I now know that it'll take 277 cans of Coke Zero to kill me.